Home from UCSB on Spring break, Jackie was eager to do some rock climbing, something her busy schedule hadn't allowed her since Christmas break. We headed to Pinnacles NP to tackle a few routes before returning home in time to pick up Mom from the airport. We left San Jose in the dark, arriving in Pinnacles around 8a, only the second car in the small parking lot found at the end of East Side road. It would be filled to capacity when we returned, cars lined up at the Visitor Center waiting for spaces to become available - the park is very popular this time of year with everything so green and fine weather, especially on a weekend. It was 33F when we started out, but it would warm soon enough on the south-facing Discovery Wall that we headed to first. We wanted to climb a 5.6 route called Swallow Crack, one I'd done with Adam Jantz some years ago. We struggled some to indentify the route on this busy wall crammed with dozens of routes and their variations. On lead, Jackie made slow but methodical work of the first half of the route that goes up a thin crack followed by some face climbing before hitting the crux section at the top of what I could see from below. She initially didn't take enough pro with her, so after getting about halfway up, she tied off to a couple of bolts and lowered the rope to me in a loop. I attached the rest of the pro we had with us, she hauled it up, sorted it, and resumed climbing. There was some swearing and much grunting as she made it up the steep portion and through the crux. After that, the route eased off, and out of sight from me, she quickly cruised up to a two-bolt anchor at the top of the wall. 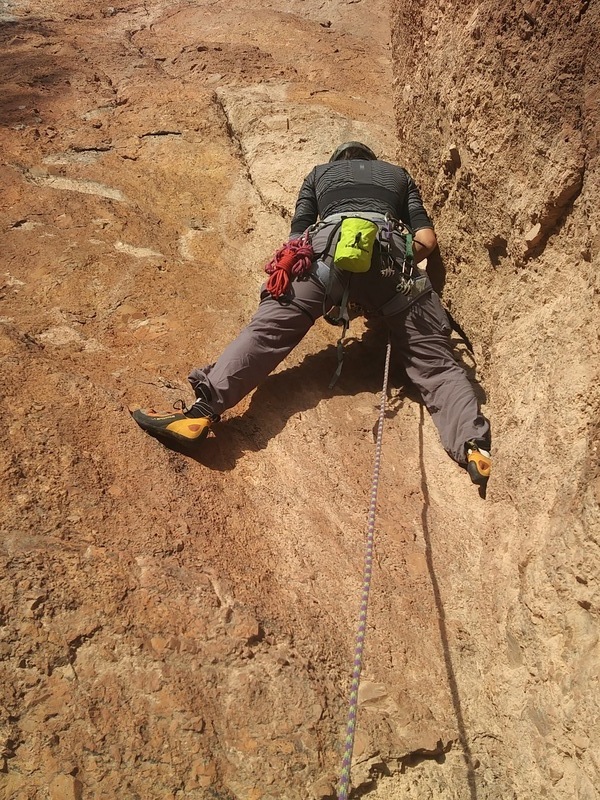 When it was my turn, I started off climbing at a good clip, cleaning as I went along. But the route got harder than I had expected and as I stood 40ft off the deck looking up at the steeper face and crux sections, I balked. I made a few sad efforts to find hold and make progress upwards, but I was quickly defeated. "Jackie, I can't climb this! You're going to have to lower me." I was feeling pretty dejected, thinking I was really losing what feeble rock-climbing skills I possessed. I was also pretty sure what I was looking at was harder than 5.6. After she lowered me back down, I examined the guidebook again and then went around the backside to join her at the top of the wall. "Hey, I think you climbed a different route, something called Fly By, rated 5.9." She was a bit incredulous, but you could tell she was pretty proud of her achievement, even if unintentional. And there was some satisfaction in knowing she could now lead a climb her old man couldn't even follow. For my part, I was just glad to know it wasn't a 5.6 route I backed off from. We set up a rap station at the two bolts and rapped back down to the bottom in turn. Once there, we studied the guidebook picture a bit more to ascertain that we had properly identified Swallow Crack about 40ft to the right of Fly By. This went more or less as expected. Both routes had more fixed pro than the guidebook had shown (a good thing), but the second route was a cruiser by comparison. Jackie led again in fine style, after which I went up, cleaned the route and enjoyed myself the whole time. Ahhhhh - that's more like it! Man, I don't even lead 5.9. Darn kids! Your relationship with your daughter is awesome!